The chinchilla is in the mammal class (Mammalia). They are rodents (Rodentia), and their family is called the Chinchillidae (Chinchillas and Visachas). 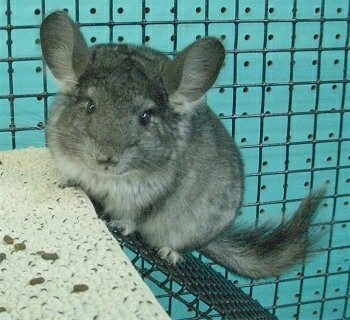 Standard gray is the natural color of a chinchilla, however many mutation and mutation hybrid colors are being bred. Standard gray colors are usually classed as light, medium, dark and extra dark. Standards should have a pure white belly and a blue hue. Some mutation colors are beige, beige bothe, homo beige, hetero beige, wellman beige, beige recessive, rzewski beige, tower beige, sullivan beige, tan and pastel, homo tan, dark tan, pearls (which are considered beige violets), ebony (coming in light, medium, dark and extra dark), (hetero ebony is another name for the medium ebony), ebony mosaic, solid white sapphire, white sapphire, white violet, white, pink white, albino (which is usually a pink white not a true albino although albinos can occur in any species including humans), tan white, pink white, white, silver, wilson white, white tail or sometimes called recessive white, stone white, solid violet or violet wrap, sullivan violet (which is a lavender), ultra violet or TOV violet, black velvet, brown velvet, violet and goldbar, sapphire, larsen sapphire, tasco, french blue, busse, royal blue, young lavender-brown, brown velvet, charcoal, sakrison, charbrown, blue diamond, gunning black, lester black, treadwell black, among others. Note these are not all official names; some are slang names people have come up with. Some of these mutation colors are now extinct, although people breeding them are constantly coming up with new ones. Chinchillas are nocturnal, which means they spend most of the day sleeping or napping. If there is something interesting going on they will be more active during the day, however. Because they sleep during the day they need to be protected from a lot of noise and disturbances during this time. The best time to play with your chin is in the evening. They will sometimes be ready to play with you in the late afternoon. 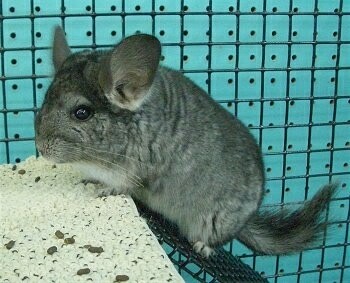 Intelligent and mischievous, chinchillas are very social and need affection and gentling. When you first acquire your chin, it will tend to be shy and run, so you will need to spend some quality time with it. Chinchillas vary in temperament. For the most part, it is very hard to make a high-strung chinchilla calm or a mean chinchilla pleasant. Chinchilla temperaments are mostly inbuilt. For the most part you get what you start with. Take this in consideration when choosing your chinchilla. It is easier to assess an adult chin’s temperament and harder to tell with kits. For the most part they do not care to be handled or petted, however when you gain their trust, they will hop up on your hand for a scratch behind the ear. Chinchillas like to chew. It is a natural instinct that you will not be able to curb. Chewing is necessary to keep their teeth filed down. Since chinchillas spend most of the day in their cages it is important to provide them with things to keep them busy. Placing new, clean cardboard in their cages for them to destroy will give them something to do. Cardboard however, is not strong enough to do an adequate job at keeping their teeth filed down. Also you need to monitor how much cardboard your chin is digesting. If he appears to be eating a lot of the cardboard you need to cut back on the cardboard play. Some chins will allow you to hold them, although they generally do not like to be held or cuddled. To hold a chinchilla use two hands, supporting their back legs in one hand, and their front feet slightly higher than the back with the other hand. Hold them up against your body to give them a more secure feeling. Be careful not to squeeze them too tightly. It is OK to hold a chinchilla by the base of the tail for very short periods of time. Chinchillas like consistency and do not like changes and being moved around. Chins have long memories; if they are frightened, they will remember it and will reject whoever frightened them until their trust is regained. Chins can be trained to some extent by consistently rewarding good behavior with a treat. They will continue the behavior expecting the treat. Do not raise your voice to or frighten the chinchilla unless it is for a wrong or dangerous behavior, like chewing electrical wires. Chinchillas will bite if they feel threatened. 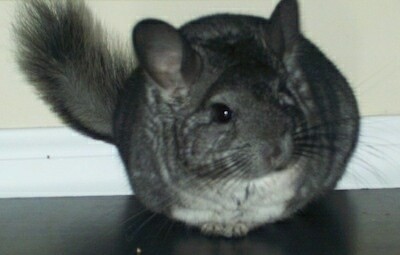 Chinchillas do not make good pets for anyone who has allergies to animal fur or dust. They do not always make the best pets for children, as they do not like to be held and cuddled, but may be OK for an older child who understands the needs and temperament of the chin. Chinchillas are sensitive to stress and noise, so approach them in a quiet way, handle gently and provide them with active stimulation. Chinchillas make a variety of squeaks, squeals and odd sounding barks. They do not make vocal sounds often, but rather the noises they make come from their chewing and rearranging of the things in their cage. Since they are nocturnal, these noises usually occur at night. About the size of a small rabbit. The female is usually larger than the male. Chinchillas must be kept in a wire cage or they will chew their way out and can easily overheat in something like an aquarium. Be sure the wire is not painted or coated with plastic or the chin will ingest this coating. The wire mesh should have spaces no larger than 1 - 2 inches (2.6 - 5.1 cm) apart, ½ - 1 inch (1.3 - 2.6 cm) if you are breeding. Some cages have wire mesh bottoms with pull-out trays which make cleaning the cage easier. Mesh bottoms are not recommended for chins because they have delicate feet and toes that can easily become caught in mesh of almost any size. If you do have a cage with a mesh shelf, be sure the spaces between the mesh are no more than ½ inch (1.3 cm) apart to avoid leg injuries. The chin’s cage should be big enough to allow him to get adequate exercise. They enjoy running around and playing and the cage has to be large enough for this, especially if you do not allow your chin much time outside of its cage. A chinchilla that does not get to run and play will be an unhappy chin. It is important to monitor the temperature where your chin cage is being kept. In the winter months it should be kept in a draft-free spot. The ideal temperature for a chinchilla is 68° F. One owner reports, "I keep mine at a constant 58 and they love it. I find they are more active at this temperature than at 60 or higher. They can stand it to just about freezing just fine." In the summer, if you do not have air conditioning it needs to be kept in a well-ventilated area. Keep the cage out of direct sunlight. In the summer the chin should be kept in an area which is no hotter than 75° F (24° C) and caution should be taken at temperatures this high. Anything hotter than this can cause your chin to become ill. If the temperature goes as high as 86° F (30° C) your chin may be in trouble. Measures should be taken to cool your chin down. Since chins don't sweat, blowing a fan at them will not cool them off, it will just blow hot air around. Chins sleep during the day and it is not wise to wake your chin up during this hot spell, because if he starts to run around he will make himself hotter and may cause heatstroke. Cage trays need to be changed once a week if you only have one chin, more often if you have more than one chin in the same cage. If you have a cage that does not have a pull-out tray it will have to be cleaned more often. Many people in the pet community prefer fleece liners. Other options are kiln dried pine or aspen shavings. Avoid cedar bedding. If newspaper is used it will have to be cleaned every few days as newspaper is not very absorbent and will begin to smell. Shavings or newspaper can be used in the pull-out tray or in the floor of the cage if you do not have a pull-out tray. Cages should be totally cleaned and disinfected once a month. The chin should be removed from the cage during this cleaning. It is especially important to do this thorough cleaning if your chin is sick. If kept clean, chinchilla cages have little odor. Chinchillas tend to pee in one corner of the cage. This corner should have more bedding to help absorb the waste. You can also sprinkle baking soda in that corner to help absorb any odors. Chinchillas are pretty much odor free. They like to chew and they need things to chew on in order to keep their teeth filed down. They should be given something to chew on such as chin blocks (or pumice blocks) which can be found at your local pet store. If a chin does not get enough things to chew his teeth will grow too long, preventing him from being able to eat. If this happens take him to a small animal vet to get his teeth filed down. A chinchilla's coat can become very oily. Chinchillas bathe in dust. They require a dust bath to keep the oils down. A special type of sand that is extremely fine is used for the dust bath. This sand can be found in your local pet store along with the bathtub. You can also use another medium sized container as the tub if you wish. 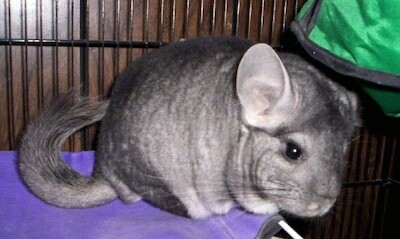 Normal sand should not be used as it has sharper edges and will bother the chinchilla’s skin. The sand must be spot cleaned every day to remove dirt such as droppings, hay or urine, etc. It should be completely changed once a week. Chinchillas are considered hypoallergenic because their fur is so thick that they do not emit dander. Some people are allergic to their dust however. Chinchillas need a constant supply of a high quality pellet (no treats included), hay (timothy/brome/orchard grass/etc. ), preferably not alfalfa as their pellets are alfalfa based, and water. For treats, rose hips, Cheerios, unfrosted shredded wheat, rose buds, and whole wheat pasta are OK. Raisins, nuts, fruits and veggies should not be given as the sugar content in these foods is too high and can disrupt a chin’s microbial balance. Any changes in their diet need to be done slowly, mixing the new food in with the old. Chinchillas should have a heavy dish that is not easily knocked over. A 2 inch (5 cm.) high ceramic bowl will do nicely. You can also use metal feeders that attach to the side of the cage. These feeders are nice because they prevent the chin from peeing in its food. Peed-in food should be changed right away. Water should be given in a gravity driven bottle with a metal spout that hangs on the side of the cage. Since chinchillas will chew, if the bottle is plastic, it should be hung on the outside of the cage with only the metal spout sticking through the cage. If any of the plastic is reachable by the chin, it should be protected with something such as wire mesh. Water bottles should be changed and cleaned daily with soap to avoid bacterial build-up. Be sure to thoroughly rinse the soap out from the bottle. Chinchillas need exercise to be happy, healthy pets. 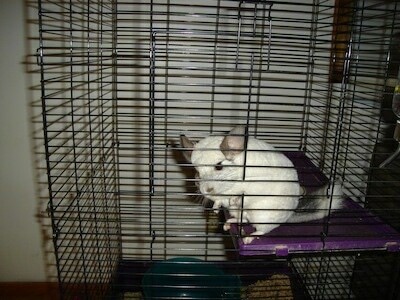 Your chinchilla will enjoy a large exercise wheel if your cage is big enough to accommodate one. Take caution if you have very small babies in the cage to make sure they do not get their feet caught in the wheel. If you do have very small babies in the cage it is best to take the wheel out until they get bigger. 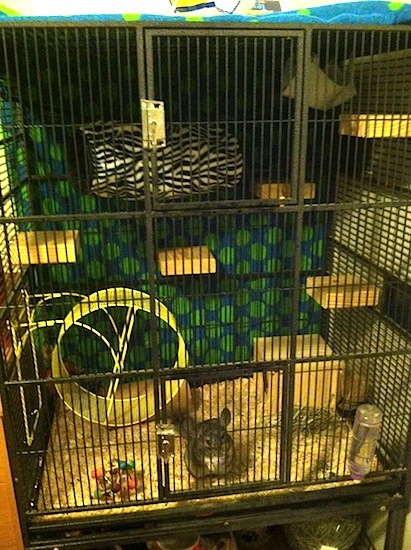 Even with a big cage a chinchilla should have at least an hour a day outside its cage to run and play in a chinchilla-proofed room. Remove all items that could cause a potential danger to your pet such as electric cords, poisonous plants and cleaners. Take care that your chin does not chew anything you do not wish him to chew such as your couch! Any time spent outside the cage should be supervised. Up to 10-20 years in captivity. 10-15 years in the wild. Chins are prone to uneven teeth, overgrown teeth, spurs, fur biting, fungal infections, diarrhea, constipation, heatstroke and seizures. Male chinchillas are sexually mature at around the age of 5 months and females at about 8 months to 1 year. This does not mean a chin cannot get pregnant before this time, however. When females are about 6 months old they start to go into heat about every 25 to 35 days. A female can generally have about 2 litters a year, giving birth to about 1 to 6 kits per litter. The chinchilla's gestation period following a successful mating is about 109 to 120 days. Females can also get pregnant right before and right after they give birth, because of the presence of two cervixes and a dual uterine horn. When a chin becomes pregnant immediately after giving birth it is called a breed back. Breed backs are not advised to any breeder. The Chinchilla originated from South America. 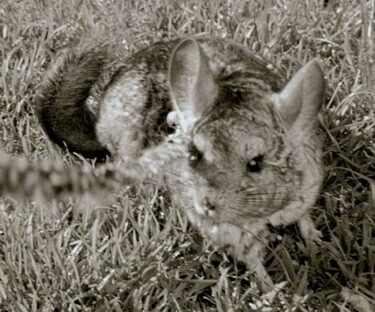 In the early 1900s the chinchilla was almost extinct because they were killed for their fur. It takes 80-100 chinchillas to make a single fur coat. In 1918 a gentleman by the name of Mathias F. Chapman was working in Chile when he saw his first chinchilla. He set out to save them from extinction. Chapman and 23 other men spent the next 3 years trying to trap the chinchillas. Because they were so scarce they were only able to capture 11. It took 12 months to bring these 11 chinchillas down the mountain of Chile. They took every precaution necessary so they would not lose any to the temperature changes they encountered on the way down. 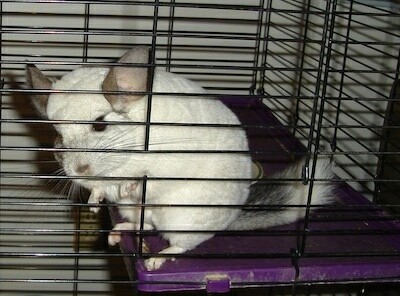 During the shipment to the U.S. one chinchilla died and a new one was born. These 11 chinchillas were the beginning breeding stock for all of the chinchillas in the United States today. By the middle of the 1960s, thousands of chins were being raised throughout the United States and Canada. 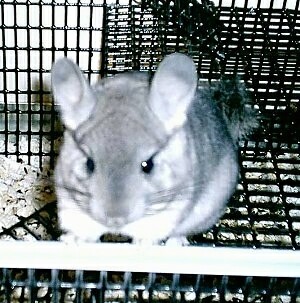 The name Chinchilla is Indian for "little chinta." ECBC = Empress Chinchilla Breeders Cooperative, Inc.
"This is my two-and-a-half-year-old chinchilla Techo (in this picture he just turned 2). He is a standard grey chin. I put him on a ferret’s leash for the first time and after getting used to it, he loved it. I took him outside and when he ran around in the grass, I could not resist; I had to take a picture and it's been my favorite picture ever since! Techo has an awesome personality!! It's been a lot of work, even getting him at eight weeks old; it took about a year for him to get totally comfortable with me. Now he gets all excited when I get home, the first thing I do is open his cage and he runs up my arm to come say hi. He does have his days where he doesn't want to see me, but everyone has bad days and it only makes it his personality more awesome!" Note: Some chinchilla owners do not suggest putting them on a leash, stating, "They are dangerous to chins and can break their ribs which are smaller than toothpicks." Isabella the standard gray chinchilla at 4 months old—"My chinchilla lives in Florida and her name is Isabella. She's very loving and active! I let her out as much as I can as I do go to school and work, but when I get home she's already at the cage door making noises telling me to let her out. She loves to get under the sheets with me (watch out for the poopies) I've been teaching her tricks. She comes to me when I call her and I just started getting her to turn around for a treat." Standard grey baby chinchilla, Lia—her name is Irish for "gray" and Spanish for "rose." Chiquitita, the pink white chinchilla in her cage—Chiquitita's owners bought her a marble slate to help her keep cool during the hot summer months. She loves it! "This is Gus-Gus, our 1 ½-year-old chinchilla. He is a very energetic and intelligent creature. Gus-Gus enjoys jumping from the different levels in his 6-foot tall cage and trying to figure out how to open the cage door. He also enjoys interacting with our dog (from his cage and ball) and taking dust baths. Gus-Gus does not like certain television shows that have higher pitched music. He runs to side of his cage closest to the TV and chatters at it until we turn to another program!" "This is Kole, a standard grey chinchilla. He's 5 months old. He's taking a break from running around his room. I took the picture of him while he was resting." "Hello! 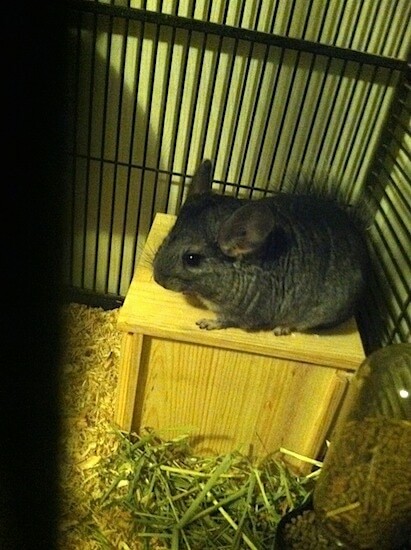 I am the proud owner of a rare silver chinchilla. He is so cute and adorable and very energetic." Note: "Silver" is not an official color name for a chinchilla. There are lots of mutation colors being bred. Silver chinchilla note: "Silver" is not an official color name for a chinchilla. There are lots of mutation colors being bred.